Yea! My waterfall is running again and I'm so happy to hear the soothing sound of it for my tea in the garden. 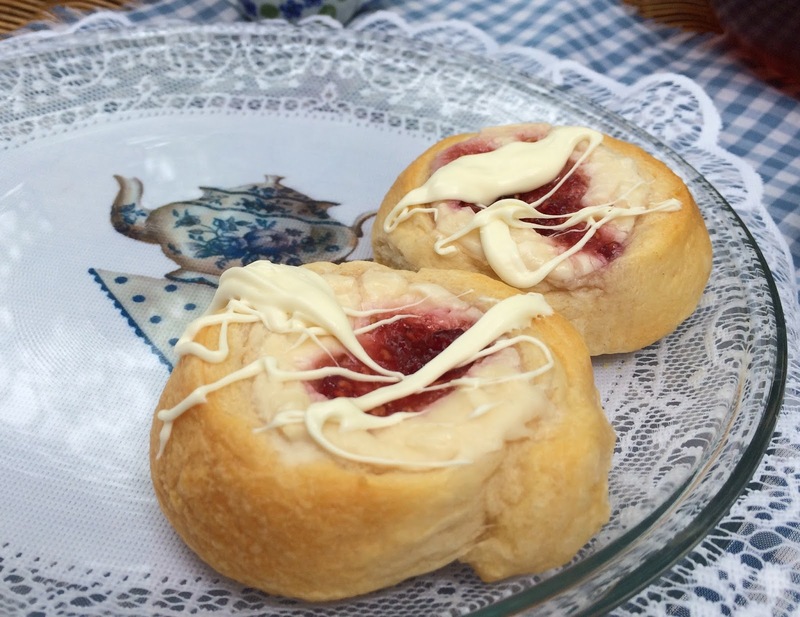 Please join me for a raspberry cream cheese danish, won't you? I've made some Constant Comment tea and a new method for iced tea, which I'll share below. I've shared this teacup that my sister gifted to me before, and it's so pretty with the two shades of blue and the toile design inside the cup. A friend gave me this Jim Shore Angel of Hospitality. I thought she would make a pretty centerpiece for my tea. The creamer was a souvenir from the Biltmore, when my Late Beloved and I visited there. I sandwiched this pretty doily that I won from Nancy at Two Cottages and Tea, several years ago, between two glass Ikea plates. I love how you can change up the design of a plate like this. Chill the roll in the freezer for about thirty minutes. Preheat oven at 350 degrees. Beat together cream cheese, vanilla and sugar until smooth. Crack open the tube of crescent rolls and slice the crescent roll in its original form, like slice and bake cookies. I got eight out of the roll. (Sandi got 10 out of the Grands Crescent Rolls). 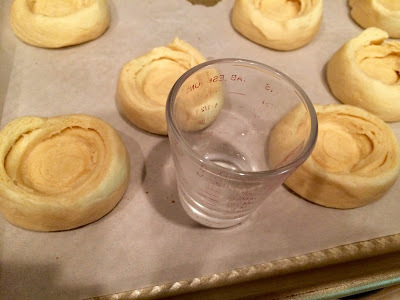 Put them on cookie sheets and use the bottom of a small glass to make an indentation in each one. Put some of the cream cheese mixture into the dent and then add a dab of jam on top. Bake about fourteen minutes and then cool completely. Beat together a little powdered sugar with a bit of milk to make enough to drizzle on the danish. Double the ingredients for a crowd pleasing treat! I used this itty bitty measurer to make the indentions. Here are the danishes right from the oven and before being drizzled. When I was at the hairdresser's this past time, I picked up a copy of Martha Stewart Living magazine and took a picture of this method of making iced tea. It works out great and is the perfect temperature for me, as I don't like icy cold drinks. Be sure to add extra ice, if you do! I love your hospitality angel and those Danish looks so yummy! What nice tea and danish Kitty!! A pretty tea table as usual and I'm happy to see your waterfall running too! Easy enough to do for the danishes and I may just make some when it's my turn for goodies at bible study. What a perfect Tea Party those danishes look yummy !!!!! Hope you had a wonderful Mom's Day, you deserve it lovely lady. I love water running too, I have a river near by and the sound is just as lovely and soothing, specially at night. Thanks for the yummy recipe. These look delicious and so pretty, too!! I'm pinning the recipe (as usual). :-D I love the teacup from your sister (toile is my favorite) and the creamer from Biltmore is charming! I would love to sit outside with you and share a cup of tea while listening to the running waterfall. Thanks for sharing with us and have a wonderful day! Your Hospitality angel is super cute, Kitty and she certainly suits you. Your Danish looks wonderful and I love how simple this recipe is. I will be making it when my family is all home this summer because they make a lot especially if you use the two cans. I do love the teacup from your sister. I hope you had a lovely Mother's Day weekend, my friend. Hi Kitty, these look so yummy and easy! I have that same angel! I love it, but I just packed her up for a rest til the fall. Have a wonderful week. Kitty, you always have pretty tea sets. The danish look delicious...raspberry is my favorite, too! Hi Kitty, what a clever way to use a doiley! It looks so pretty placed between the plates! Thank you for mentioning my blog! Your tea today looks so inviting. 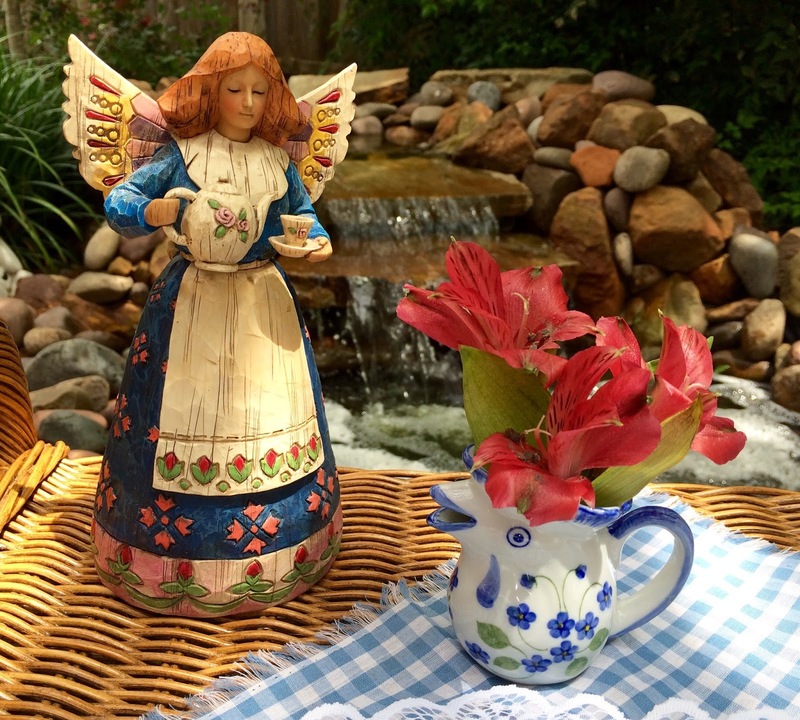 I love the sound of waterfalls and your tea table setting so special with memories. Dessert sounds lovely! I need to make it soon. 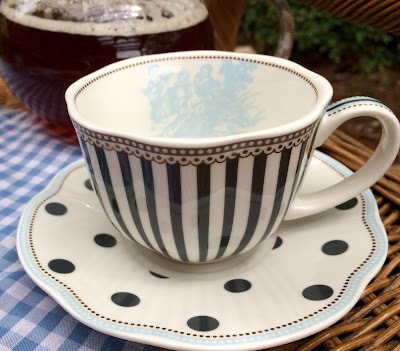 I've always admired your blue striped and polka dot teacup. I also really liked how pretty the doily looks between the two glass plates. Thank you for sharing the iced tea recipe. I'll have to try this method next time I make some iced tea. I think I would love some of those for breakfast in the morning. Would you mind bringing some over? Just kidding of course but they do look amazing. Thanks for linking and sharing. Your danish looks quite easy to make and I too would love the raspberry. Happy to see your beautiful waterfall running, Kitty. It makes a great back drop for your photos. Lovely way to dress up your clear dishes. Your Jim Shore angel is beautiful! I love his work. A friend gave me a Jim Shore Christmas ornament, but I would love to collect his angels. Thanks for the deliciously easy Danish recipe! I've been looking for one that's easy to make. God bless you with a happy Spring. Your iced tea recipe will be used by me! When I lived on North Carolina, they would offer water or iced tea so I would most always choose the iced tea. I hardly drink it these days! Your Jim Shore angel is beautiful Kitty, and the Danish looks like it came from a bakery. I save many of your recipes, so thanks! I love Danish..and yours looks amazing. We have a little water fall, from the hot tub into the pool, and it is such a fun sound...glad your fountain is working again. I love your hospitality angel! I have a collection of angels! The danish looks and sounds wonderful! This is such an enticing & EASY recipe, Kitty! I must invite some friends over to share them soon. I don't dare make them until others are coming, as I'd eat every single one! I have a friend who orders her tea like that, fresh brewed with a tall glass of ice on the side. She doesn't like fake instant tea mixes (me neither) so this is how she gets her iced tea when dining out. Thanks for sharing the pretty photos...I love your Jim Shore Angel of Hospitality...it is SO YOU!!! Kitty, your tea look so pretty. I'm glad you got fountain going again, and I'm sure it adds to the peacefulness in your pretty garden. 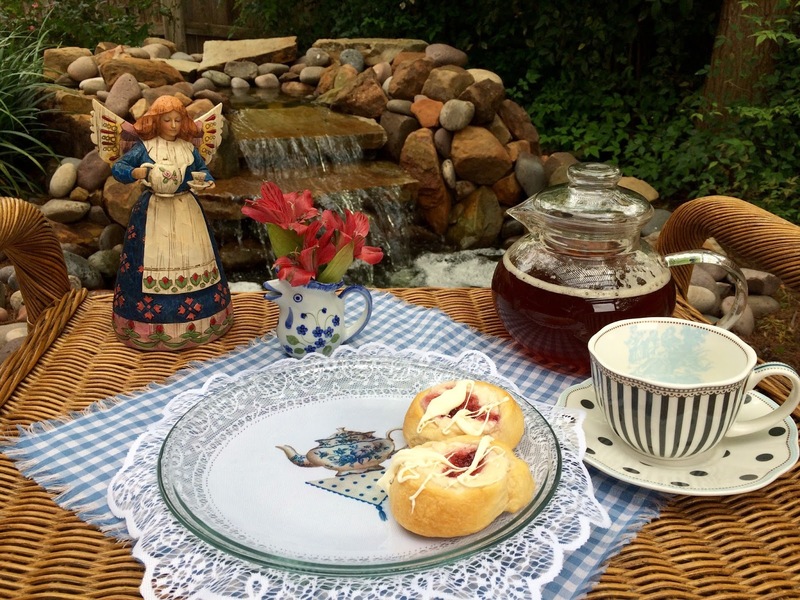 I love the teacup and saucer-so jaunty!The raspberry danish looks to die for! My favorite idea in this post is the Ikea plates with the doily. That is really a great idea, and one that I want to try for sure. Have a wonderful week! Yes, Kitty it is me. I was having problems with the old blog showing up on a number of people's blogroll so I decided to start over. YUM! I've never made a danish and I used to love them during business meetings when I was working - it's been THAT long since I have had one. This is an awesome easy recipe, one I truly need to try. Thanks Kitty. Lovely tea and I would love to join you Kitty! The danish look delicious and it is a great recipe. The angel and teacup and saucer are so pretty. Hope you are enjoying a great week………. Kitty, raspberry cream cheese is my favorite Danish! I think I pinned Sandi's recipe, but I'll pin again just in case I didn't. lol! That teacup is darling and your angel is sweet. Thanks for sharing with SYC. Love the sandwiched plates with the lace- cute idea! The angel is sweet. Those Danish have my attention- not too hard to make which is what I like and they look delicious! That looks like a good way to make ice tea. Remember when "solar" tea was popular- I still have my big jar to make it which I haven't done in too long. Well, I am easing back into the world of blogging after my little break and time spent with family. It was great, but I have missed you all. I am sitting here wishing that I had one of those raspberry cream cheese danish right now with my coffee. Great to see you here with us at Thoughts Of Home On Thursday! Such a lovely vignette. Looks scrumptious! Kitty, that looks lovely. Would like to sit down with you in one of your beautiful tea spots and enjoy a cup of tea and raspberry-cream cheese danish. Wonderful Kitty! I love your polka dots, and the doily sandwich is such a good idea! I love Constant Comment tea as well. The recipe looks wonderful. And I did make the cinnamon chocolate scones, but next time will reduce the cinnamon just a smudge. Thanks so much for linking to Tuesday Cuppa Tea! What a beautiful setting to have your tea! I would love to sit out there and visit with you. :) A water feature is just so soothing and relaxing to me. The danish looks and sounds fantastic! I wish I had a couple of them right now. You always make your tea time look so beautiful and I love that cup & saucer! Kitty I thought for sure this was going to be a time consuming recipe but I cannot WAIT to try it. Oh how about a lemon curd center? Thank you so much for linking up to Thoughts of Home on Thursday. You make our gathering a happier place. So happy for you to be able to enjoy your waterfall. I am sure it is a wonderful spot to sit at and enjoy your tea. Such a wonderful Angel figurine, tea cup and your tea time snack looks delicious. Kitty this recipe looks divine. I'm so going to try it for a special occasion this Summer. Did you change your header? It looks great. I love your Jim Shore Angel, I actually have some of his Angel's which I love. Your Danish looks fabulous! Thanks so much for sharing with Full Plate Thursday and have a great day!